A few weeks ago I got my hands on some Paleo Powder, a gluten free, msg-free and certified Paleo Friendly product. I particularly liked the "Paleo Powder Pink" version, which included both black and white pepper as well as Himalayan pink sea salt along with cayenne, garlic, onion, and other spices, and immediately began to think of ways that I could use it. 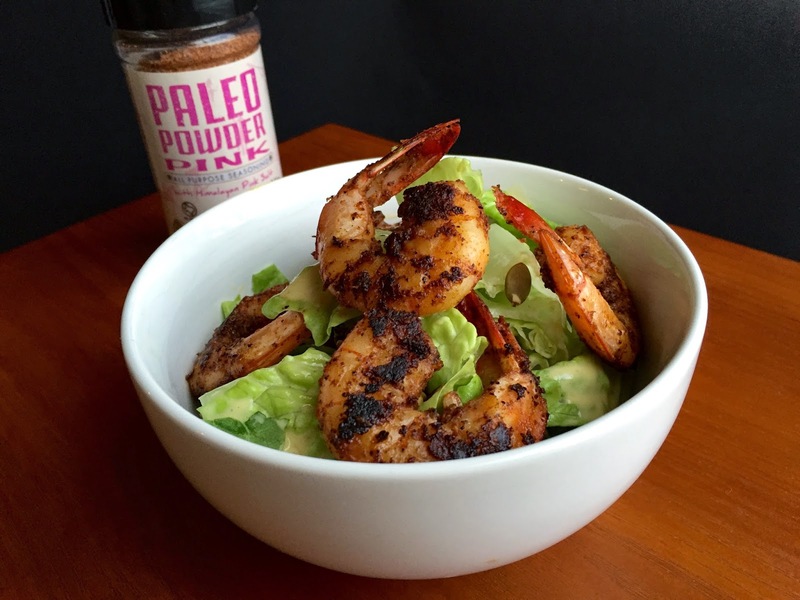 It's great on eggs, chicken, and even greens, but where Paleo Powder really shined was when I used it to blacken some locally sourced Mayport shrimp. Blackening is a technique that came out of Cajun cooking in the Louisiana bayou. It became widely known when Chef Paul Prudhomme, who specialized in Creole cuisine, brought the technique to the mainstream through his restaurants, cookbooks, and food products. Chef Paul's original recipe called for redfish as the protein source, the fillets were dipped in butter, dredged in the spice mixture, and cooked in a hot iron skillet. The charred and burned spices are what gives blackened foods their intense flavor and distinct appearance, and the technique can be applied to just about anything. While it is unknown who the first person was to blacken shrimp, I can assure you that this technique is a perfect match for these slightly sweet, perfectly plump little crustaceans. Paleo Powder Pink also makes blackening a breeze since you don't have to source numerous spices, it's all perfectly blended and ready to go. However, if you don't have access to Paleo Powder, you can certainly make a blackening seasoning at home. These shrimp are full of flavor and perfectly compliment salads (such as my King of all Caesars Caesar Salad) and pasta dishes (gluten free of course), but they are also great on the grill as an impromptu "surf and turf" or simple seafood spread. On a stovetop or outdoor grill, get a cast iron skillet smoking hot (a drop of water should immediately sputter and sizzle away). Dredge your shrimp first in the melted coconut oil and then generously sprinkle with Paleo Powder Pink. To make it easier to flip the shrimp, you could skewer 4-5 of them together on a wooden or metal skewer, although adding single shrimp to the pan works fine as well. Note: If cooking indoors, make sure your oven fan is on because the blackening seasoning will smoke. Allow the shrimp to cook ~5 minutes per side or until firm and fully blackened.